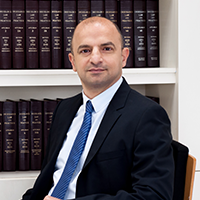 Practice Areas: Moshe heads the D&O Liability Department. Moshe represents the insurance market in complex D&O claims including coverage issues, monitoring and representation of insurer’s interests in litigation concerning coverage issues. Moshe Heads the Aviation Department (General liability and Hull). The team handles Hull and General liability claims mainly for foreign Insurers. The team was involved in the litigation of most of the GA claims in Israel. Moshe has particular expertise in disputes concerning the Montreal Convention, cargo claims, subrogation claims and provides consultations to air carriers. Moshe also specializes in Professional Liability Insurance, Product Liability, Private International Disputes and Commercial Litigations. Education: A graduate of Bar Ilan University. Membership: A member of the Israel Bar Association since 1998; A member of the International Association of Jewish Lawyers and Jurists.